Now this one is certainly a little less historical than the others, if only because most of the profiles are about companies founded in the last ten years. Written by Jessica Livingston, a founder of YCombinator, the book profiles some of the hottest and most successful startups in Silicon Valley history. It shows how the founders manage to create massive growth, usually with very few resources. Now I’m not saying that companies like Hot or Not compare with the accomplishments of Pericles or Da Vinci, but you can certainly see how this book captures a moment in time—and its leading men and women—and what that means. This is the most current book on the list (besides mine) but I think many of you will like it. Plus you can learn a lot about the tech scene in one swoop. I read Founders at Work in the earliest few months of Buffer, before I had managed to drop my freelance work which I was doing on the side to pay the bills before our revenues grew. It was inspirational and practical at the same time, and laid out very clearly the paths that many of the biggest tech successes took to reach their prominence. What probably helped, ironically, was the feeling of confusion when reading the book Founders at Work: Stories Of Startups Early Days. I read the book when I first became interested in startup culture and I was under the impression there was a formula for success that all startups had followed. While reading the various stories contained within the book, I was confused when every company seemed to follow a different path to success; founders came from different backgrounds, different motivations and started at different ages. There are themes, in many of these stories, but it was the realization that you don’t have to be a 20-something, Stanford Grad, with a Computer Science degree to start a company that really helped me pursue my interest in startups. Founders at Work is the most valuable business book I’ve ever read, which compiled transcripts from dozens of tech entrepreneur interviews before the bubble burst. When asked what books he would recommend to youngsters interested in his professional path, David mentioned Founders at Work. Founders at Work and Coders at Work are really good ones too. They’re filled with interesting and inspiring stories. 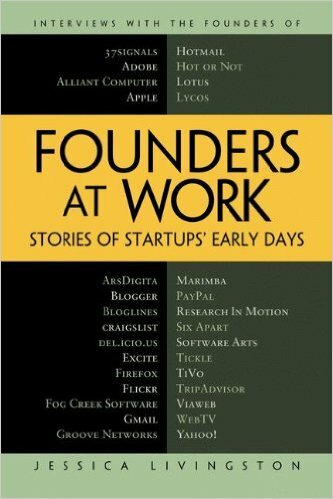 Founders at Work: Stories of Startups' Early Days is a collection of interviews with founders of famous technology companies about what happened in the very earliest days. These people are celebrities now. What was it like when they were just a couple friends with an idea? Founders like Steve Wozniak (Apple), Caterina Fake (Flickr), Mitch Kapor (Lotus), Max Levchin (PayPal), and Sabeer Bhatia (Hotmail) tell you in their own words about their surprising and often very funny discoveries as they learned how to build a company. But ultimately these interviews are required reading for anyone who wants to understand business, because startups are business reduced to its essence. The reason their founders become rich is that startups do what businesses do―create value―more intensively than almost any other part of the economy. How? What are the secrets that make successful startups so insanely productive? Read this book, and let the founders themselves tell you.